Video: Psalm 83 or Ezekiel 38; What’s Next? The news headlines above clearly point out that Israel is not currently dwelling securely. The tiny Jewish state is protecting its northern, eastern and southern borders with security fences. Israel’s western border is protected by the Mediterranean Sea. Someday, when Israel dwells securely the prophecies described in Ezekiel 38 and 39 will occur. Interestingly, the security fences that Israel has constructed have nothing to do with Ezekiel 38, but everything to do with Psalm 83. In fact, none of the Ezekiel 38 invaders share common borders with Israel. Ezekiel 38:8-13 mandates that Israel must be dwelling securely, without walls, bars, or gates, and in the center of the land, probably alluding to the Genesis 15:18 land mass. Additionally for Ezekiel 38 to find fulfillment, the Jewish state must be in receipt of great spoil. In my estimation, Israel today is not fulfilling these prerequisite conditions; at least not yet. Israel is unable to dwell securely as a result of their surrounding Psalm 83 hostile Arab neighbors. Walls, bars, and gates exist in Israel today in order to protect them from being terrorized by certain members of the Psalm 83 confederates, such as Hamas, Hezbollah, and the Palestinians in general. Additionally, the goal of the Ezekiel 38 invaders is to destroy Israel and take their plunder and great spoils. Israel doesn’t presently appear to possess all of the great spoil that Russia and their coalition will someday covet. Some Bible prophecy teachers believe that Ezekiel 38 is about to find fulfillment, but the stage does not appear to be ready for this to occur. 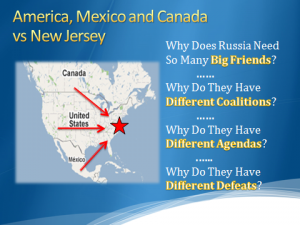 The image above compares it to America, Canada and Mexico attacking the tiny state of New Jersey. 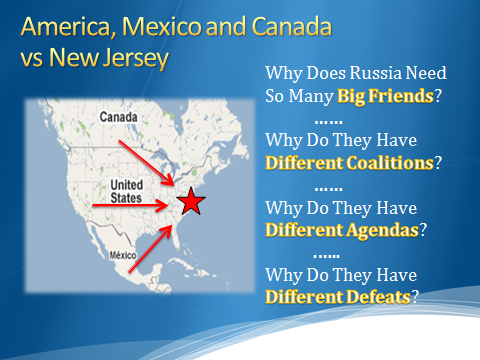 Something needs to happen to warrant Russia putting together such a vast coalition to attack Israel. What is it? You are invited to watch a teaching video by Bill Salus that explains the differences between Psalm 83 and Ezekiel 38. In the end analysis, it appears as though Psalm 83, rather than Ezekiel 38, could be the next prophetic Mideast News Headline. Video teaching was done at the 412 Church in San Jacinto, CA on April 26, 2014.